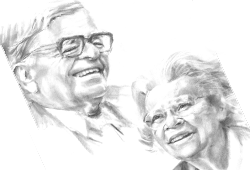 Although they announced several years ago that Christine, alum and true benefactor to the art department at Ashland University, that they were making a significant gift to the art department and at least a $1 million deferred gift to the Ashbrook Center, it was not until her death and the subsequent revelation of her estate plans that the level of generosity was truly known. It was all possible through their marital trust and will arrangement. Brad, although a Wooster college graduate, had deep roots at Ashland through the mission of the Ashbrook Center and the fact that both his grandfathers were founding members of the College, 125 years ago. It is only appropriate that during Ashland Universitys 125th year of celebration that he, too, announces an additional gift from his trust to fund special future needs of the Ashbrook Center. Foundational gifts such as these are encouragement to all. It is with a great sense of pride that the Mishlers have been able to adopt many, many Ashland University children as part of their family legacy!